Sonoma County offers broad, sandy beaches, secluded coves, rugged headlands, natural arches, a craggy coastline with fertile tide pools and offshore reefs. The Sonoma coast has 16 miles of some of the most breathtaking scenery in the world. If you would like to be within walking distance to Goat Rock State Beach check out the Tidesong home vacation rental. Or to explore the Salt Point State Park discover the Timber Sea rentals. When abalone season is open the pre-dawn drive up the coast is a regular event for lovers of this ocean born culinary delicacy. 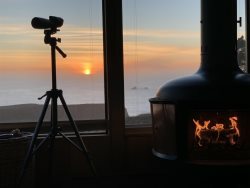 Any of our accommodations welcome divers celebrating an invigorating abalone hunt along the bottom of the ocean close to shore. A divers paradise in Timber Cove, 1/2 hour north of the village of Jenner. Come enjoy one of our exclusive ocean front vacation homes.